Forget all the comparisons that cover Deadlands – it is more than capable enough to stand on its own. One day during the World Soccer Cup in 2010 the Rotters came. Humanity would be lost, if it wasn’t for the mysterious robed Guardians. They’re the only thing that stands between humans and Rotters, but their protection comes with a price. More and more teenagers are handed over to the Guardians for unknown purposes. The public doesn’t seem to mind, they even worship them. Lele isn’t a Ressurectionist though, and when she comes into contact with like minded people, there is no way back. Deadlands gets compared to The Hunger Games three times on the cover, but I barely see any resemblances. Yes, there are teenagers shipped off to unkown whereabouts that probably mean death, and yes, there is some kind of rebel group, but that’s about where the comparison ends. There is a small undercurrent of rebellion throughout Deadlands, but the main focus of the book is Lele and her friends and family. I really liked Lele. She has a quick temper and is easily enraged. She is the outcast at school with her shorn hair and Agricultural ways. This part of the book didnt’t turn into a pity party with endless examples of why high school is awful though – something I was really glad for. Part of her outcast status is her behaviour, as she inherently hates people that worship the Guardians. Especially as the book progresses Lele has a good understanding of her actions and emotions, without losing the teenage tendancy to feel things out of proportion. There is a small love triangle in this book, and it wasn’t one that I hated. Whew, I never thought this day would come! Lele is so genuinly confused of her feelings, that I didn’t mind at all. It also helps that she didn’t declare her undying love to any of the two. One of the strongest points in Deadlands is the interesting world it is set in. First of all I liked the South-African setting and the occasional use of South-African words and slang. It was especially fun for me because I’m Dutch – a lot of South-African words are influences by Dutch, so I understood most of them. I usually connotate South-African fgiction with the Apartheid, and but Ms Herne handled the subject very well by mention it in passing, but not letting it take over the entire book. Secondly, of course, is the zombie-fication of the city. I loved the way we ate thrown in instead of getting a huge info-dump at the start. There are tons of details to bring the story alive throughout the book, with some big revelations at the end that fit perfectly. The only thing I disliked was the strong foreshadowing. Foreshadowing is a tool that should be handled sparsely, and sometimes Ms Herne takes it a bit too far. Sentences like “I thought I’d be safe. How wrong I was” fill the endings of several chapters, and I started rolling my eyes at them after a while. I’d have liked the story better wityhout them. 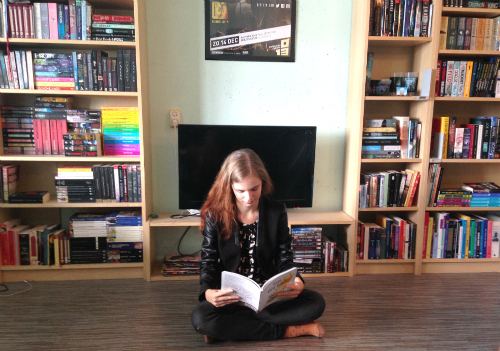 I read the ARC though – it might be different in the finalised version. It seems that zombie fiction of the new generation is less about killing the shambling dead, and more about political and ethical consequences. 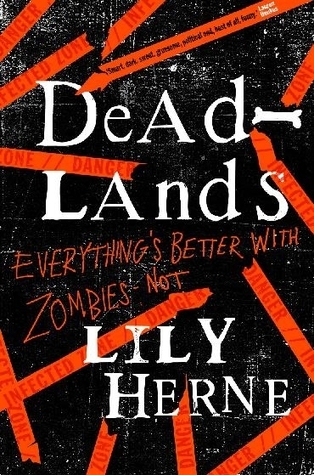 Deadlands is a surprisingly light zombie novel with more than enough love and laughter to keep it from being depressing. It doesn’t compromise on world-building though, and it features a creative view on zombies that I haven’t seen before.